NEW YORK -- Sandy split New York City in two. The massive storm left people damp, miserable and in the dark in the lower part of the city. Yet in much of the rest of Manhattan, life was almost normal, albeit without some of the usual urban comforts. Almost every street below Times Square in the city's Midtown district lost power on Monday night after an explosion at a Consolidated Edison power station, and it may not return for up to four days. A number of these areas had already been hit by flood waters. As a result, residents in Lower Manhattan emerged from their homes in search of the necessities of life on Tuesday. Ariel Ramos, 33, waited in the doorway of the Loisada Deli for ice to keep food in his refrigerator from spoiling. "What else you got?" he shouted into the darkened store. "Talk to me. I need stuff!" The clerk said he had no more bread, but he did have eggs. Ramos asked for eggs and a pack of cigarettes. "We have no electricity, no heat and no water," he said. Further north, restaurants and bars were open for business. With schools and the mass transit system closed, families strolled around taking pictures of felled trees. Burgers and Cupcakes on 35th Street and 9th Avenue was busy. A small crowd grabbed 99-cent slices of pizza on 41st Street, and a bakery called the Little Pie Company had a line 13 people long. As the worst of the storm hit New York City late on Monday, water poured through streets and into buildings on Manhattan's southern tip, swamping parked cars and cascading through subway stations and tunnels. That was when the power transfer station on 14th street exploded and plunged the lower half of the island into darkness. Daylight on Tuesday coaxed residents, many of whom were spending a second day away from work, from their homes. Some were jogging or strolling with their dogs, picking their way over downed branches. Young people with cameras took pictures of flooded stores downtown. But for others, sightseeing was the last thing on their mind. 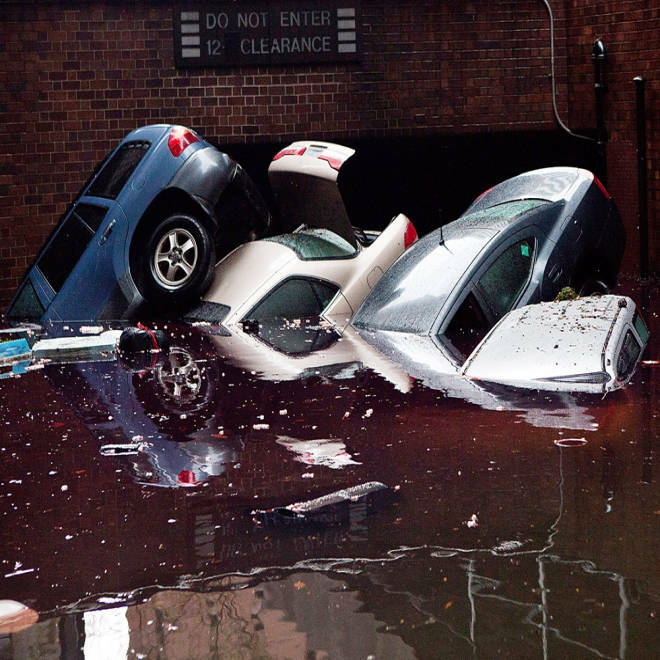 Raymond Torres, who spent the night in his apartment in the Baruch Houses complex, located near the Williamsburg Bridge on Manhattan's Lower East Side, looked hopelessly at his soggy Honda, its interior full of leaves left behind when the water receded. His daughter, Diana, stood ready to take him to her apartment in the Bronx, where there was still power. For some, the FDR Drive, which runs along Manhattan's east side and which is normally jam-packed with traffic, was a giant park as they strolled among the downed trees and other detritus of the flood. The highway was closed to traffic in both directions, except for emergency vehicles. Chinatown, where the narrow streets are usually crowded with people and rich with smells of fish and spices, was mostly closed, its jumble of neon signs darkened. The boundary of the power outage, which varied from east to west, was noticeable not only by its working traffic lights but also by the sudden presence of cooking smells from buildings that still had power. The streets in Midtown Manhattan were drier compared with those farther south. In Herald Square, at 34th Street and 6th Avenue, a family from France stood in drizzling rain, trying to decide what to do for the day. The museums they wanted to visit were closed. Florence Buin, visiting from Rennes with her husband and two children, said the family stayed in their Times Square hotel, expecting to have to weather a severe onslaught from the storm, but what they experienced was very mild. "We were quite surprised," she said. "We were waiting all day long and we saw nothing." The Broadway musical for which they had tickets on Sunday night was canceled and so was their train trip to Washington on Monday. "In France we say 'a lot of noise for nothing,'" Buin said. The Upper West Side, a wealthy enclave of Manhattan, did not lose power and only New York's mass transit standstill was keeping people home. Several grocery stores, restaurants and bars were open. Some people were taking pictures of each other in front of a car hit by a fallen tree. Further south, in front of the Archstone apartment building on 40th Street and 2nd Avenue, a group of 20-somethings with coffee in their hands sat in front of the building charging their iPhones. They said they lived just one block south on 39th Street, where power had been cut off. Lee Fleischer, a professor at Brooklyn College who lives in the Murray Hill neighborhood of Manhattan, was canvassing the streets trying to find D batteries for his flashlight. The price of two batteries, which normally cost around $5, had been jacked up to as much as $15 in the few neighborhood bodegas that were open despite the loss of power. "They can get away with this very easily," he said. "They are exploiting their customers and the community, though." At La Delice Pastry Shop, in nearby Kips Bay, the price for a cup of coffee had been raised from $1 to $3. A store clerk said the reason was that they had to use bottled water to make the coffee. In Manhattan's Lower East Side, Thea Lucas, 87, who lives alone, said she had come down from her apartment to warm herself up with a walk and to feed seven cats in her street she feels responsible for. "Cats are survivors. They all waited for me at the usual spot even though I came out much later today than I usually do." "I'm lucky to have gas; I can make hot water. But there is no heating and I'm all cold inside." She said the night was difficult without electricity. "There is nothing to do at home. You cannot read with a flash light, I used to do that but I'm not 20 anymore." Across the Brooklyn Bridge, it was a similar story, with low-lying areas still struggling on Tuesday while on the higher ground life was getting back to normal. Brooklyn's Gowanus canal, which was a pale green color on Monday, had turned black. Receding waters had left oil slicks on the streets and sidewalks. Wood and other debris marked the high water mark, more than a block away from the canal. A brick house located just west of the canal on Carroll Street had steam rising from its foundation. A man who said he was a resident but wouldn't provide his name said the basement had filled with water from the canal in the night, and now the electrical wiring was steaming. He said the fire department told him it would not come unless the structure was physically on fire. "I'll wait, and then it'll go up like a tinderbox," he said. The Brooklyn Navy Yard, which now houses small businesses as well as a dock, was covered in about a foot of water. At the peak of the storm, it was 5 feet high. "There were 17 of us trying to pump out the docks when the pump room flooded," said Nigel Friday, 36. The pump room is on three levels about 50 feet underground and workers were on all three levels trying to keep the water from hitting electrical components with sandbags, Friday said. "Then water started gushing in through the entrance we took to enter the pump room," he said. "That's when we had to drop everything and run out the other way. It was like a movie." Higher up, Park Slope, a section of Brooklyn popular with young families, was largely saved from harm. A few branches had fallen on the street, and some store front awnings had been stripped off by heavy winds, but that was about the worst of it. People were strolling about, bars and restaurants were open, albeit with limited menus. Thistle Hill Tavern on 15th street in Brooklyn, was offering "Frankenstorm" drink specials. Nearby, in Brooklyn's Prospect Park, massive felled oak, maple and sycamore trees lay across walking and bicycle paths. A police vehicle driving the park's interior road announced over a loud speaker that the park was closed, yet area residents poured in. Children climbed on downed trees, and runners weaved through the many strollers and dog walkers. Additional reporting by Robin Respaut, Olivia Oran, Ilaina Jonas, Mirjam Donath, Jeanine Prezioso, Ed McAllister, Atossa Abrahamian; Editing by Eddie Evans, Martin Howell and Cynthia Osterman.